BravoTape, MegaTape, PoleTape, and TexTape offer easy ways to hem and fabricate your banners. Regular banners, pole pockets, or even fabrics we have the tape for the job! Forget the hassle of folding over double-sided banner tape to make a banner hem! Simply apply tape over PowerTabs along the top and bottom edges on the back of the banner. After applying the BravoTape, punch holes through the tape, tab centre holes, and banner media, then run rope though the hole. Use BravoTape® to create a super strong banner of any length. 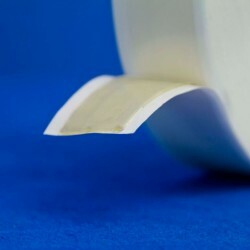 Single-sided super strong film. No need to fold hem. Duplicates the strength of folded hem and double-sided banner tape, but eliminates the hassle! Eliminate the risk of damage to image by post-print sewing. Create a perfectly sharp digital banner. No rippled hem. Fabricate a mighty banner in only 3 minutes! 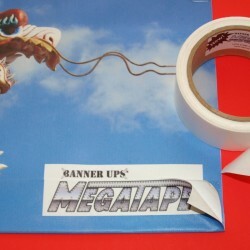 Banner Ups® MegaTape is a double sided version of our BravoTape recommended for 3 applications 1) when the customer wants a folded hem; 2) for a double sided banner when you want to hide the tape inside a folded hem; 3) when ULTIMATE STRENGTH is desired. Banners made with MegaTape withstood winds up to 98 MPH! Easy to apply. Wears like steel! Banner Ups PoleTape is a highly aggressive pure adhesive film used to make pole pocket hems or for splicing banner media together. PoleTape is a faster and more cost-effective solution than sewing or welding pole pockets. Ordinary double-sided tapes do not have the strength needed to make reliable pole pocket hems. 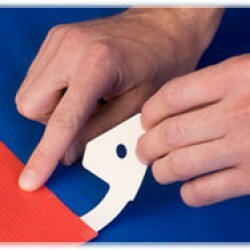 PoleTape can be used to make strong pole pocket hems without sewing or welding. We do recommend that you pre-test PoleTape with your specific media and environment to make sure you are satisfied with adhesion levels. Samples available upon request. PoleTape™ – Extremely aggressive adhesive for creating pole pocket banners without sewing. Applies like tape. Sticks like glue! No sewing or welding needed! Save time. Create pole pockets instantly. Avoid Torn Ugly Pocket Hems!